Eurodollar has broken its consolidation channel downwards and may continue falling. We think, today the price may reach level of 1.2050, form another consolidation channel, and then break it downwards to reach level of 1.200. Such descending movement implies that the third descending wave may reach level of 1.1500. Pound continues falling. 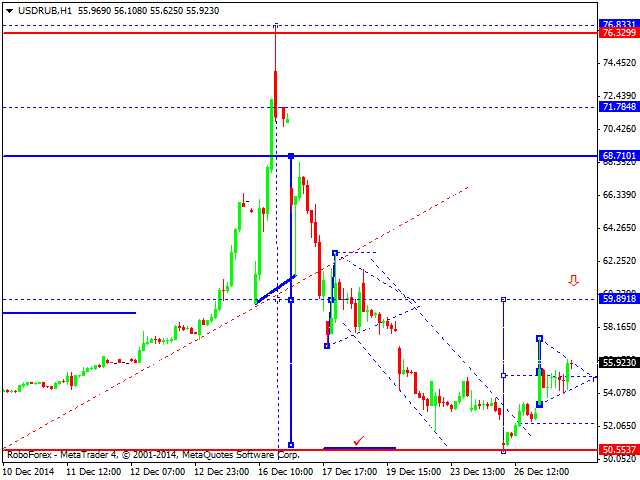 We think, today the price may reach level of 1.5500 and then return to the upper border of the trading range. 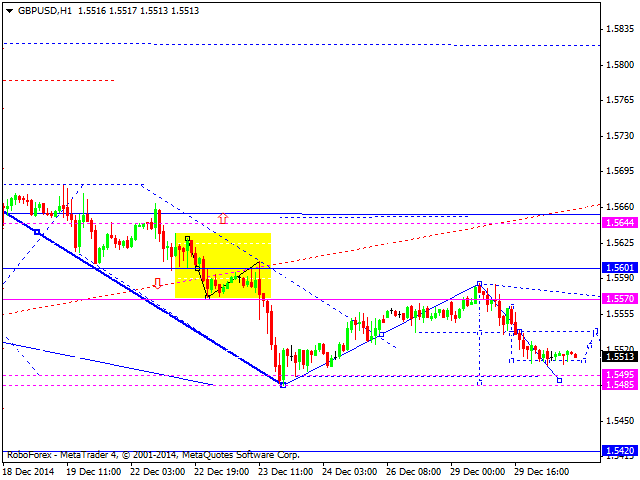 Later, in our opinion, the market may form an ascending structure with the target at level of 1.5644. Franc has broken its consolidation channel upwards and may continue growing to reach level of 1.0000. Later, in our opinion, the market may return to level of 0.9890 and then resume the uptrend to extend the third ascending wave. Yen is still forming a consolidation channel. We think, today the price may grow to reach a new high. Later, in our opinion, the market may fall to break its consolidation range and start forming a descending wave. 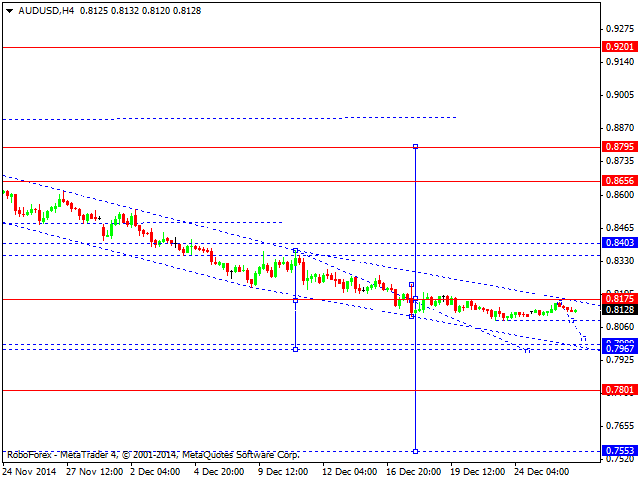 Australian Dollar is also consolidating without any particular tendency. This consolidation channel may be considered as a downside continuation pattern. 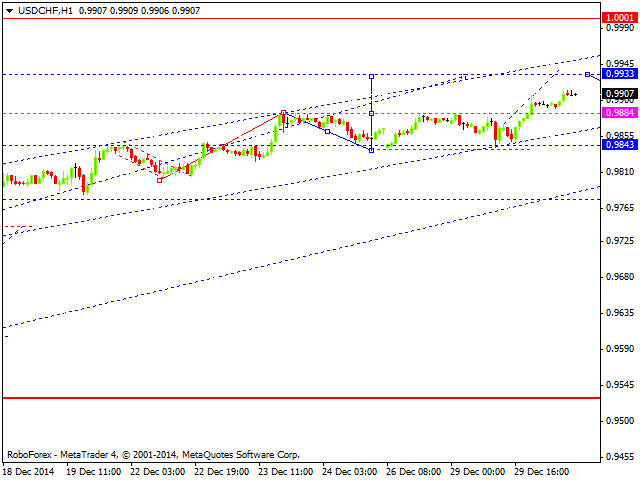 The next downside target is at level of 0.8000. The price is expected to break it, consolidate for a while, and then continue moving downwards to reach level of 0.7800. Ruble has attempted to reach level of 59.00. We think, today the price may fall towards level of 45.00 and even extend the fifth descending structure up to level of 43.00. The whole descending movement may be considered as the first descending wave. After reaching the above-mentioned target, the price is expected to start a new correction to return to level of 60.00 to test it from below. 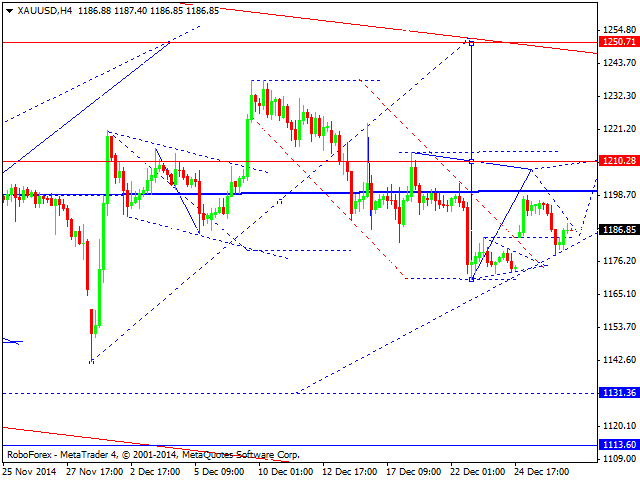 Gold has tested its broken consolidation channel from above. 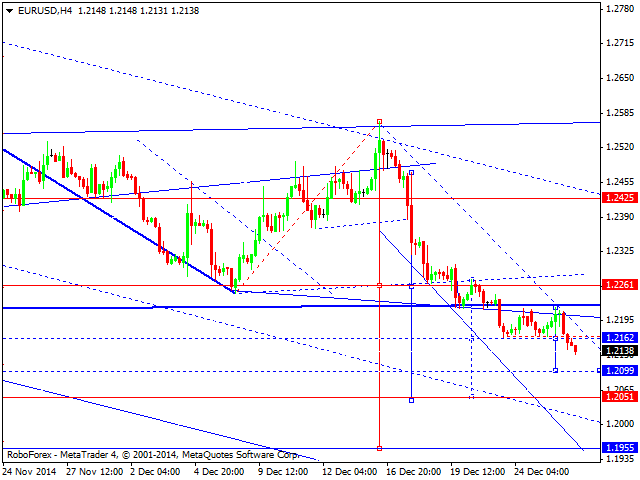 We think, today the price may form another ascending structure towards level of 1210. 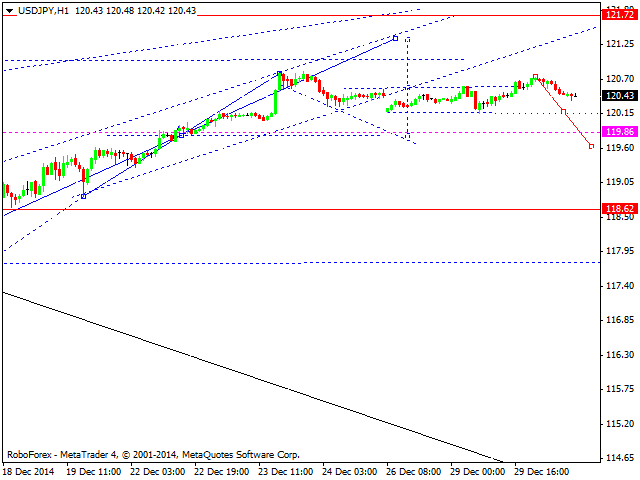 This structure may be considered as a part of an ascending wave with the target at level of 1250.